Now the demonising of industrial hemp is rapidly fading, it’s increasingly being utilised in all sorts of new applications – including high-tech 3D printing. Filaments – the “ink” of 3D printing – are most commonly made from PLA (Polylactic Acid) or ABS. Entwined, manufactured by 3DOM, is made from Manitoba-grown industrial hemp. Dyes aren’t used with Entwined so printed products retain the natural brown. 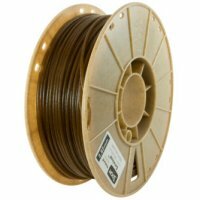 The company states Entwined hemp filament can be used with any 3D printer capable of printing with PLA – and using standard PLA settings. While a little pricey, the new product appears to have been very well-received; with the initial batch being sold out shortly after product launch. It seems 3DOM isn’t the first company to work on a such a product according to 3DPrint.com. Italy’s Kanesis has been experimenting with a hemp bioplastic filament for some time, as has Brooklyn-based company Matter Lab. Industrial hemp is said to have more than 25,000 uses. While we’ve never seen them all listed; we don’t doubt that it’s possible. As well as bioplastics, industrial hemp can be used for ropes, building materials, textiles, animal bedding, cooking oil, fuel, medicines, personal care products and so much more. As the leaves only contain a very small amount of the psychoactive compound THC compared to its cousin, marijuana, it can be also used as a highly nutritious stock fodder. Hemp is also an environmentally friendly crop compared to convention crops such as cotton. It requires little water or pesticide. It grows rapidly and densely and can even be used to remove toxins from soil; a process called phytoremediation. It’s the unfortunate genetic association with marijuana that took what is possibly the world’s most useful plant and turned it into something that was feared by some; even despised – and for all the wrong reasons. But all that is changing. Misapplied laws are slowly being altered around the world to again permit the cultivation of hemp and manufacture of hemp products. The new age of hemp enlightenment shouldn’t be underestimated – it could change the world for the better.